Crowley entered the House in 1999 and maintained a largely center-left voting record; he was seen as a strong contender to become the next Democratic Speaker of the House, after Nancy Pelosi. Crowley is also the chair of the Queens Democratic Party, making him one of the most powerful kingmakers in New York City politics. Ocasio-Cortez, a Latina from the Bronx, ran an aggressive, organized, energetic campaign to Crowley’s left, accusing the incumbent of acquiescing to real estate and financial interests rather than adequately representing constituents of the district. She has professed support for Medicare for All (which Crowley also supported during the campaign), a federal jobs guarantee, tuition-free public college, reinstating Glass-Steagall, and abolishing ICE. She further distinguished herself from Crowley by refusing money from corporate PACs; Crowley, a prolific fundraiser for the party, has raised millions of dollars over the course of his career from corporations. Crowley significantly outraised and outspent Ocasio-Cortez, but she made up for it with a significant social media presence, strong ground game, and glowing profiles in national publications. Crowley raised more eyebrows when he failed to show up for a debate with Ocasio-Cortez, instead sending former City Council Member Annabel Palma in his place, which earned him a rebuke from The New York Times editorial board. Ocasio-Cortez has said that her campaign is part of a movement, emblematic of a far-left wave that is seeking to take over the Democratic primary in the wake of the 2016 presidential election, and with a chance to flip the House at stake this fall. She is all but certain to win the general election, something Crowley noted in a gracious concession speech wherein he also said he’d be supporting Ocasio-Cortez moving forward. The challenger’s win appeared to give a shot in the arm to other progressives hoping to unseat incumbent Democrats this year, namely gubernatorial candidate Cynthia Nixon, who is challenging Gov. Andrew Cuomo, had exchanged endorsements with Ocasio-Cortez on Monday and attended what became her victory party Tuesday night. Also apparently boosted by the result are the challengers to the former members of the Independent Democratic Conference of the State Senate. Those primaries will all be held September 13. Crowley was among a handful of long-time Democratic incumbents facing spirited primary challenges on Tuesday. The others appeared to hang on, with Rep. Yvette Clarke of Brooklyn leading Adem Bunkedekko by a 1,000-vote margin with 99 percent of precincts reporting at about midnight. Bunkedekko had earned the endorsement of the Times editorial board in his insurgent campaign, but it did not appear to do quite enough to get him over the hump against Clarke. Reps. Carolyn Maloney and Eliot Engel also fended off primary challengers, by wider margins. Other than the Ocasio-Cortez victory, the other top storyline of the night was Rep. Dan Donovan fending off a primary challenge from his predecessor, Michael Grimm, that looked to be going Grimm's way before President Donald Trump endorsed Donovan. Donovan wound up winning by more than 20 percentage points, though. 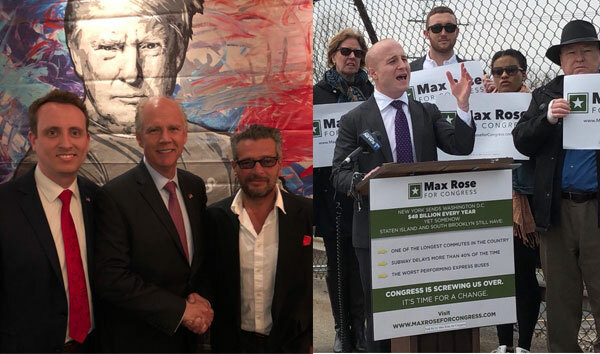 On the Democratic side in New York’s 11th Congressional District, Max Rose won a crowded primary by a wide margin and will take on Donovan in the general election, attempting to swing the lone New York City House seat in GOP hands. Perry Gershon won the Democratic primary to earn the chance to face incumbent Republican Rep. Lee Zeldin in Congressional District 1. Liuba Grechen Shirley won the Democratic primary to earn the chance to face incumbent Republican Rep. Peter King in Congressional District 2. Antonio Delgado won a crowded Democratic primary to earn the chance to face incumbent Republican Rep. John Faso in Congressional District 19. Tedra Cobb won a crowded Democratic primary to earn the chance to face incumbent Republican Rep. Elise Stefanik in Congressional District 21. Dana Balter won the Democratic primary to earn the chance to face incumbent Republican Rep. John Katko in Congressional District 24. Assemblymember Joseph Morelle won the Democratic primary to earn the chance to face incumbent Republican Jim Maxwell in Congressional District 25, a seat vacated when Rep. Louise Slaughter passed away earlier this year. These results now largely set the stage for the general elections for Congress in New York, with all 27 House seas on the ballot and one U.S. Senate seat -- where Democratic Senator Kirsten Gillibrand is facing Republican challenger Chele Farley. State-level primaries, including for all the seats in the state Legislature and the four state-wide positions of governor, lieutenant governor, comptroller, and attorney general will be September 13.